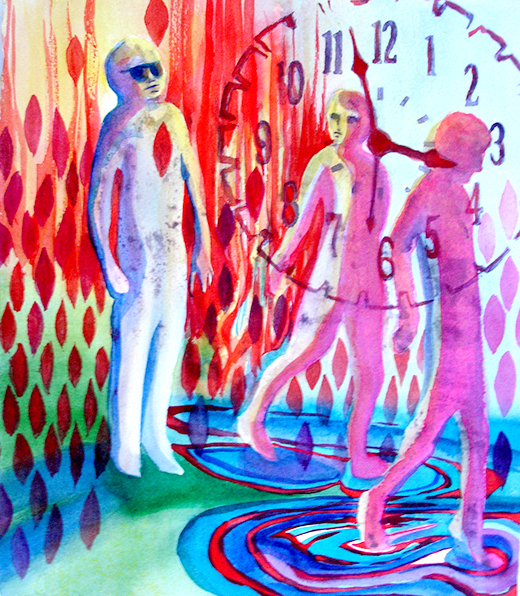 "Time and Tide" is a watercolor on paper 24" h x 48" w painted in 2018. Its images are taken from memory of experiences, but not yet "taken from Memory" with age changes. I'm exploring the interaction of the visual elements of the painting digitally in After Effects to bring together an animation that comes together under the eye of "Rembrandt in the Moon". A colorful Happy Bird is playing in the colorful fuzzy balls. When it sees a colorful Happy Cat, it hides in a pile of fuzzy balls until the cat goes away. Then Happy Bird pops out laughing because it fooled the cat. "Spellbound" is a watercolor, 24" x 24", painted in 2018. Its vividly feverish contours and cool, patterned ground transform gestural figures into a visually entwined unit. It portrays the intense attraction, not to be explained, that compels interaction of ultimate nature with another human being. 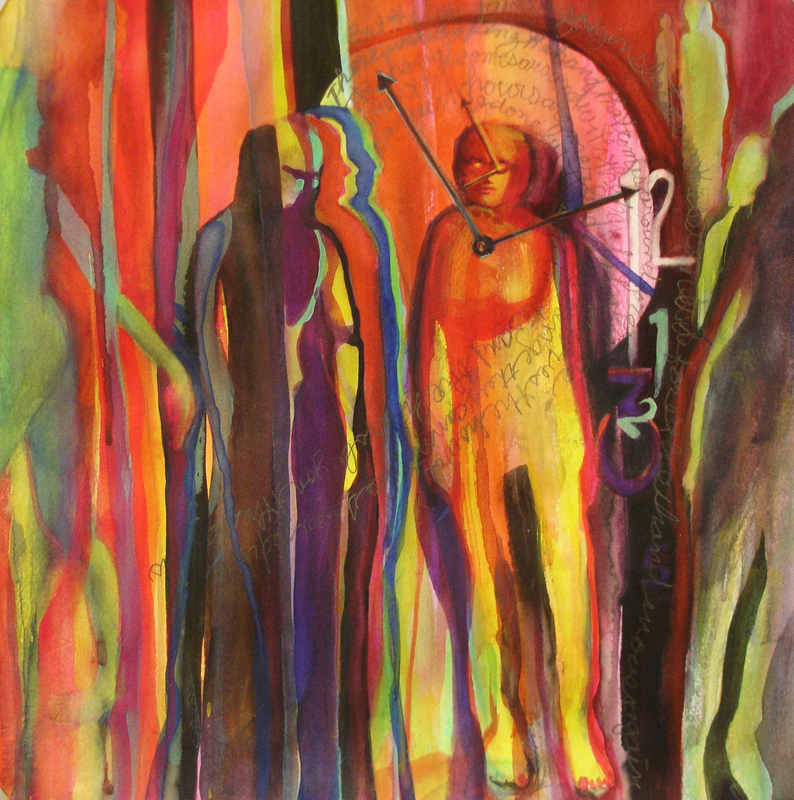 "Beam Me Up" is a watercolor on paper, 24" h x 18" w painted in 2018. 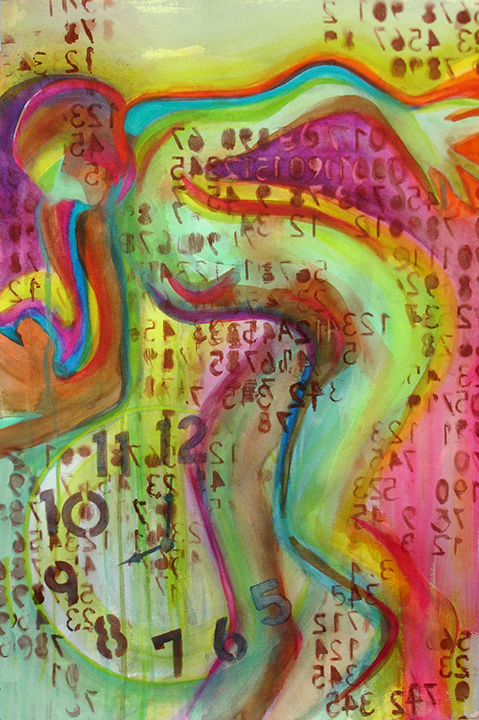 The figure of an active woman is dissolving into energies of colors, numbers, and light to be "cyber transmitted" elsewhere and materialized at her new location. The "count down" clock is starting from 12 and counting backward. Whether or not we are conscious of activity with intent, the human body reveals us. 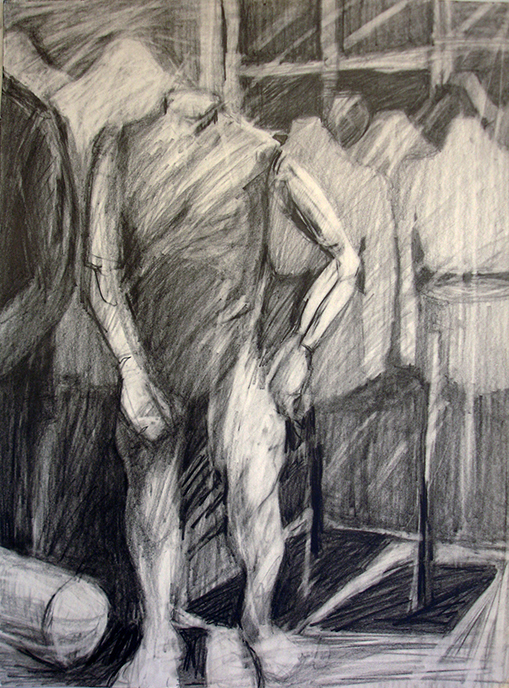 The gestural, active figure mirrors the passions, successes, and failures of our experiences. 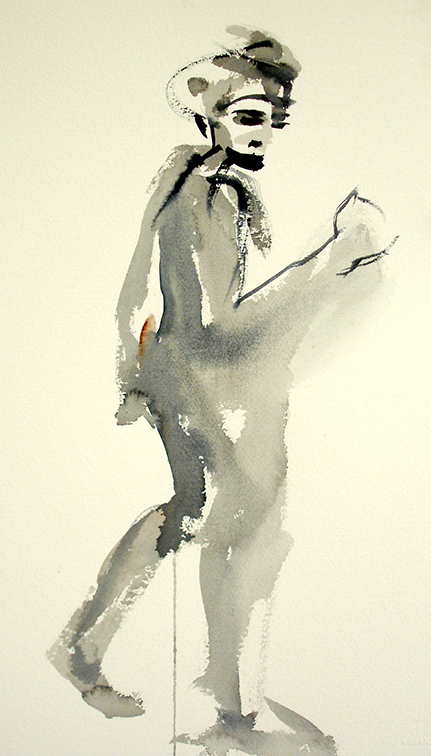 My painting approach to bodily movement is with responsive contour and gesture brush strokes. Contemplating the resulting paintings often leads me to develop points of interest with heavier contour, more value range, color, and pattern. Diaphanous figures washed in color appear and disappear. Wet shafts of color stream across bodies while form dissolves into the grids, numbers, and patterns that give visibility to surrounding spaces. On the other hand, I may choose to retain the simplicity of the short study as a statement in itself. Sensitive trails of brushwork may carry a message, the story of a person, the needs of daily existence, or any moment of life transition without elaboration. 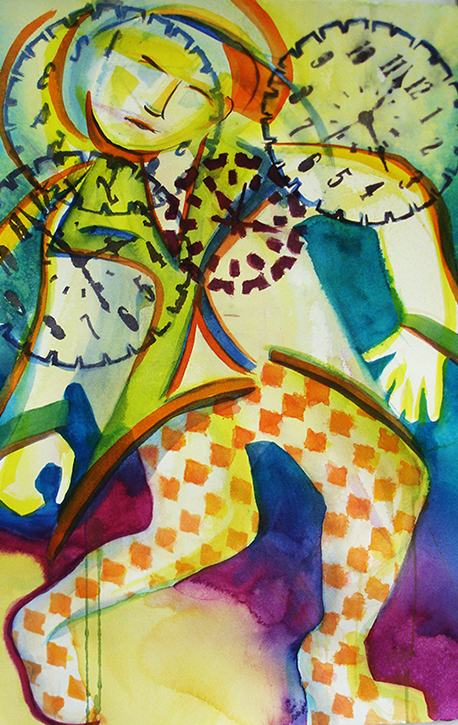 "Dancing with Shadows" is watercolor, 30" h x 22" w, painted in 2018. It's hot contours and patterns are set in a cool ground. The swirling figure is casting shadows or dancing with shadows. This could be someone dancing with youthful memories or memories of a special dance partner. 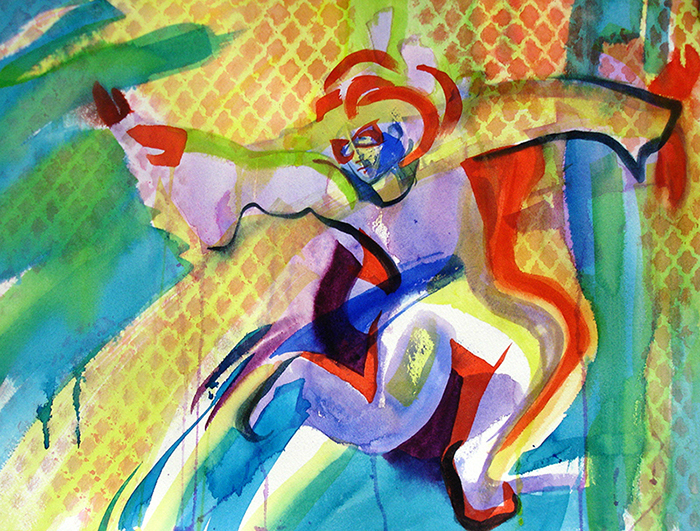 "Dance" is based on gestural brushwork, color and pattern to evoke the human energy of dance. It is a watercolor painting 15" x 22" completed in 2017. 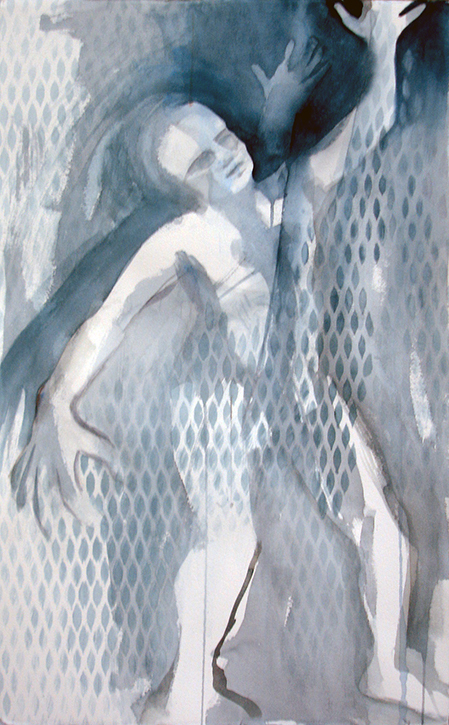 "Rapture" was started as an overlapping gestural figure painting in grayscale. Having run out of paper for the short poses, I superimposed one short, active pose over another. Contemplating the paper in the studio later I sorted out the obsessive involvement of several people. Are they fighting or loving? Is it one and the same? 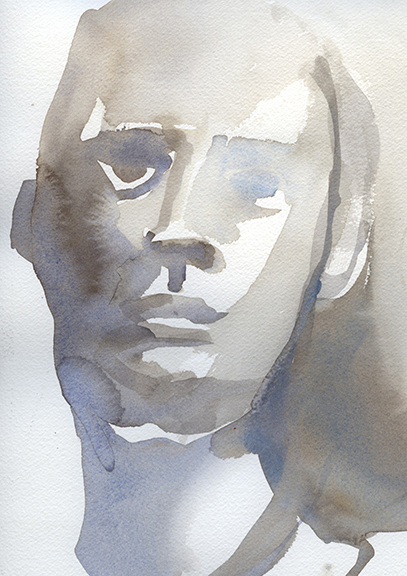 "Shadow Man" is a watercolor, 22" high by 15" high painted in 2017. 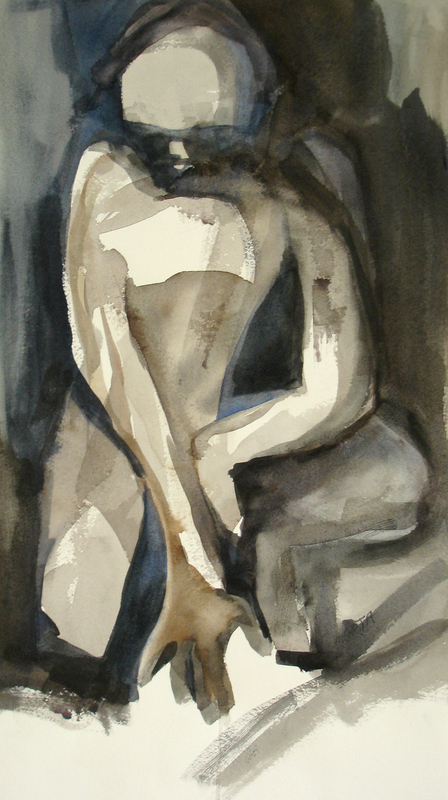 It was started with grayscale gestural work and developed further with pattern and color. 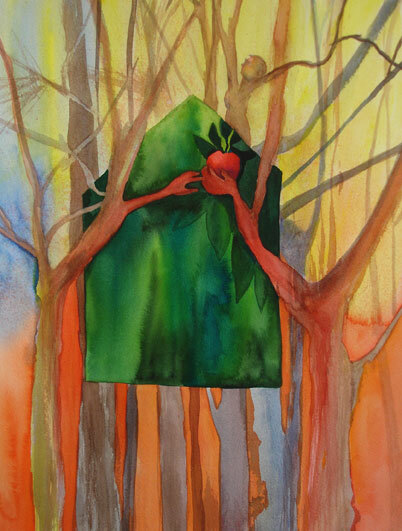 "Hunger" is a dark watercolor with spare details, 22" h x 15" w, painted in 2018. The lean figure is extends an arm for something beyond reach. 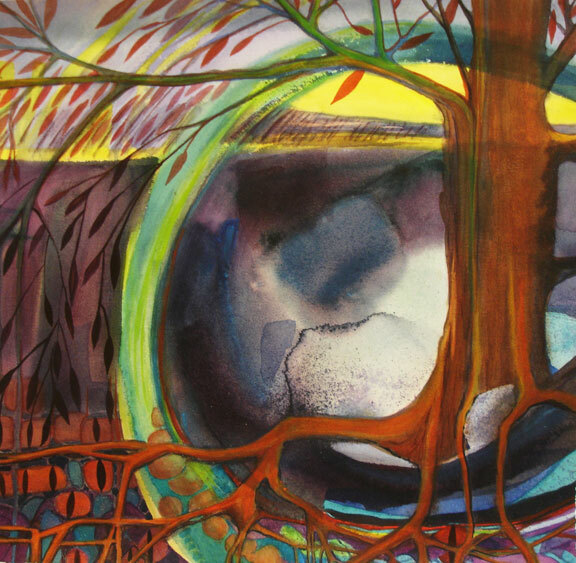 "Rebirth" is a watercolor 22" h x 15" w, painted in 2018. 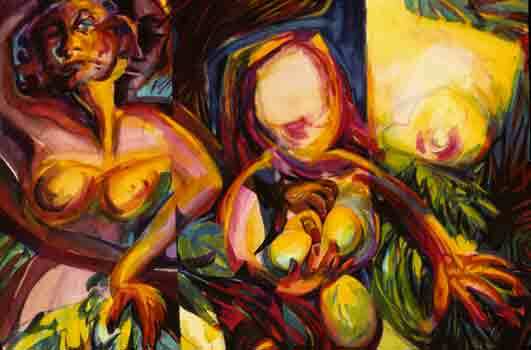 It portrays an agony of metamorphosis as the body is transformed into life beyond basic muscular structure. 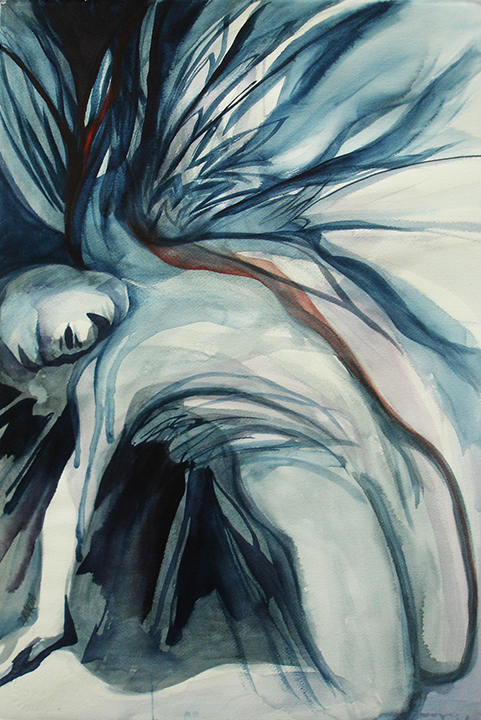 "Strength" is 22" h x 16" w, a watercolor done in 2018. The position of the figure presents sure confidence which is emphasized by the few elaborations in the painting. "Tears" is a 28" h x 20" w watercolor painted in 2018. At times I choose to focus on the simplicity of contour brushwork that can seem like only one line. 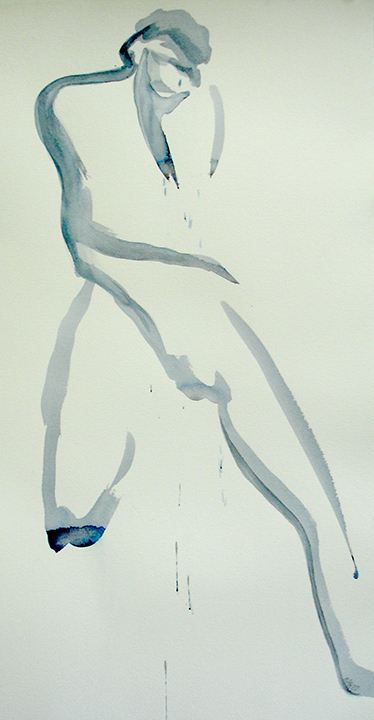 "Tears" portrays a deep sadness with bodily loss. From 2018, "Jack-in-the-Box" is a mixed media work, 8" x 8" acrylic on cradled board, it includes a face with oil on canvas seen through an opening in the board, as well as green metal wires around the opening. 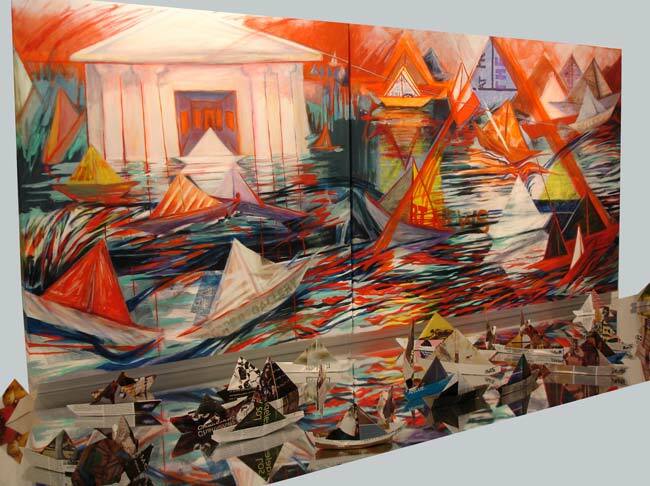 PAPER BOAT PROJECTS: I recycle the pages of current, mainstream art magazines by folding them into paper boats and signing the bow. This gives them new identity as artifacts. Grouped on a gallery floor they seem to indicate a current. On an acrylic mirror they are reflected as if in water. Wall art that I have drawn and painted referencing the boats can be installed with the boat arrangements on acrylic mirrors. 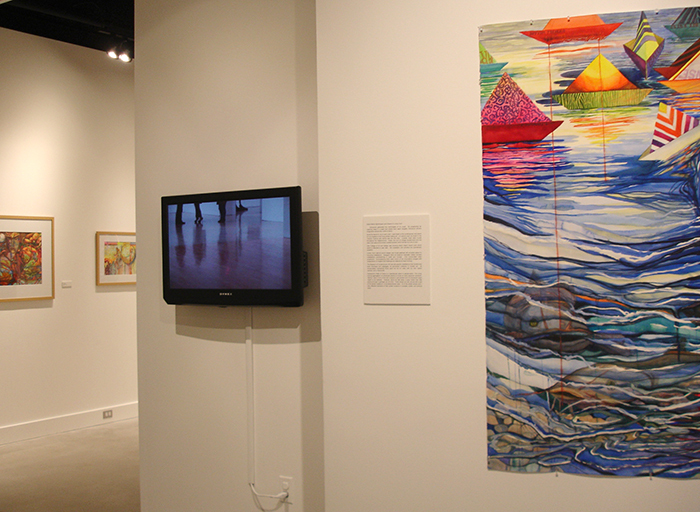 This challenges spatial boundaries visually as the wall art reflects around the boats. 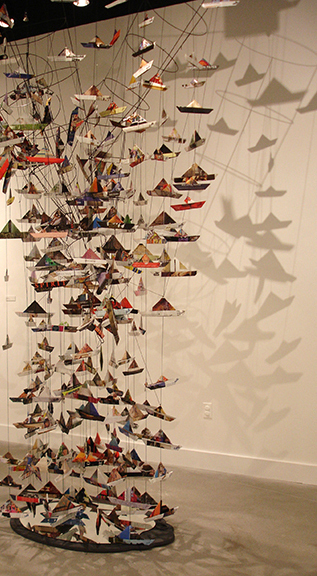 When the mirror is placed on the floor with paper boats suspended in a grid above it, movement and a new set of spatial experiences are provided. Viewers are invited to take a boat and/or make a boat. 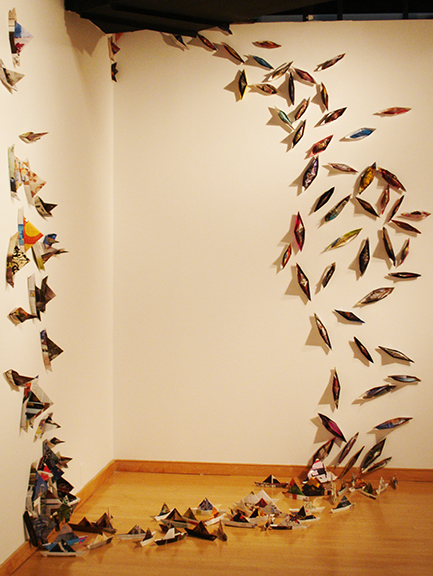 As this changes the arrangement on the mirror, the viewers become participants in the project design. Detail from "Crossing the River"
A very close up view of a detail of "Crossing the River". The "Eye Boat" is used as a character in my animation work. 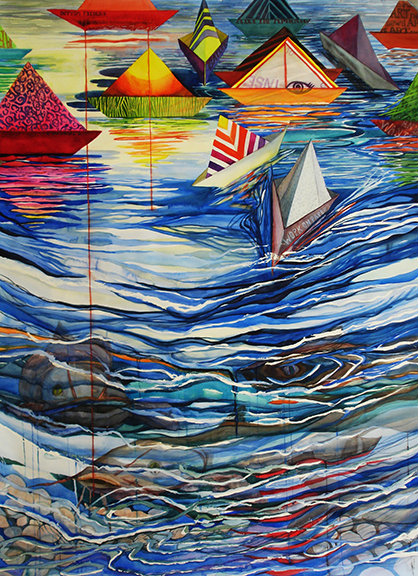 It is part of the painting "Mainstreams". 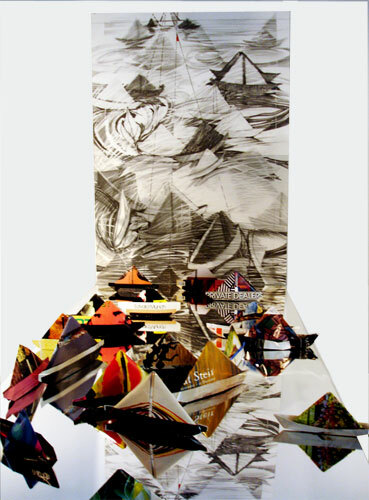 First installed in May of 2008, the 40" x 25" graphite on paper drawing was based on the paper boats which were then included in the installation on an acrylic mirror 8'long and 30" wide. 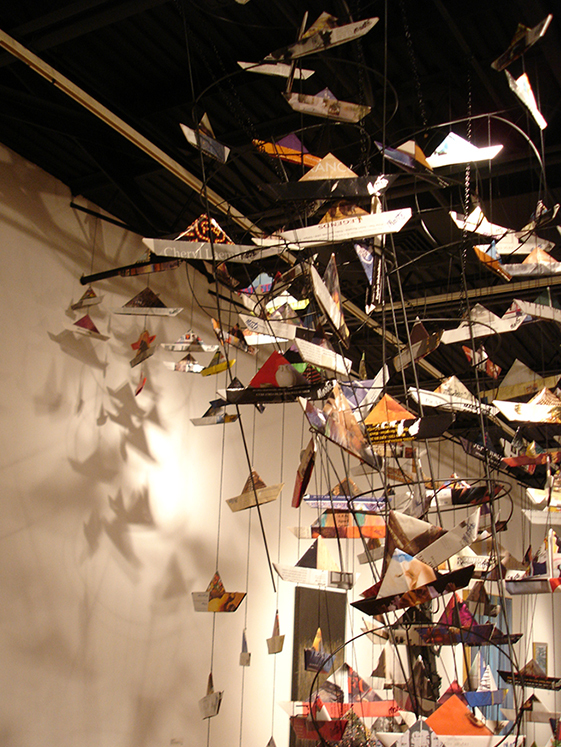 Viewers were invited to take a boat, thus participating in the visual arrangement of the installation. Of course, more boats were then added. 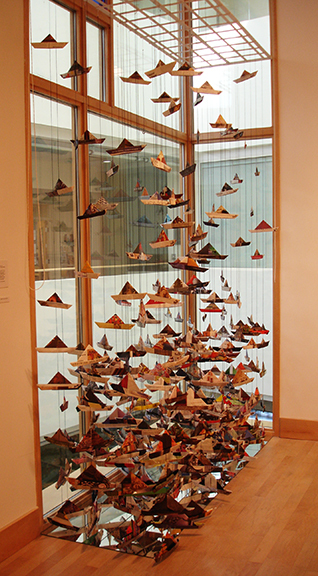 This installation was juried into "ART MD" at the Howard County Center for Arts in Dec 2012 and awarded in the exhibit. 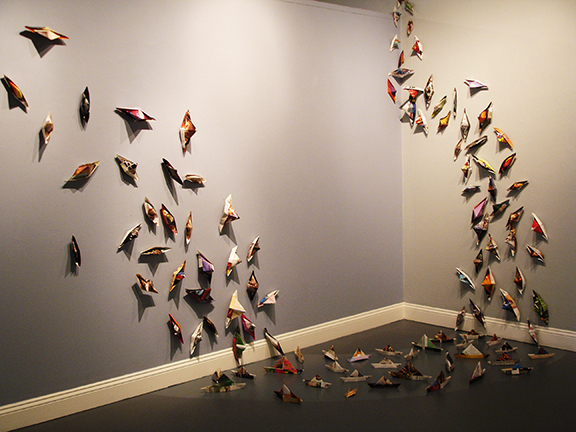 Recycling art magazines, I use the ancient art of paper folding to transform pages into paper boats. Combined with tomato tents and a mirror, they create a maelstrom of confusion in this installation which is 11 feet high and ten feet in diameter. For me this confusion alludes to the global condition. Filming video in museums and galleries, then showing them in galleries or museums, simulates the timelessness and similarity of the museum/gallery experience. Viewers think they are seeing "live feed". The feet on the shiny museum floor give viewers a sense of live feed, which emphasizes the timeless quality of museum viewing. Do you see the Giacometti? 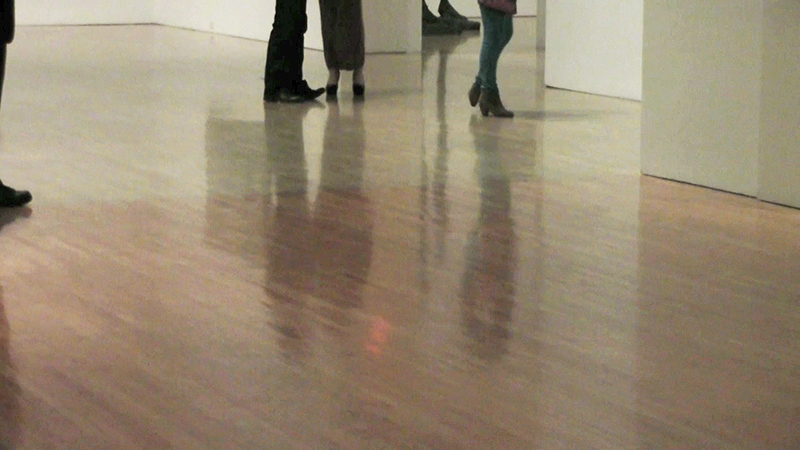 Filmed in Nov 2012 at Museum of Contemporary Art in Los Angeles. The people are random, unidentified museum goers. The sequence is edited by Diana Marta. Do you see the one permanent pair of feet that belong to a Giacometti sculpture? Filming video in museums and galleries, then showing them in galleries or museums, simulates the timelessness and similarity of the museum/gallery experience. Viewers think they are seeing "live feed". 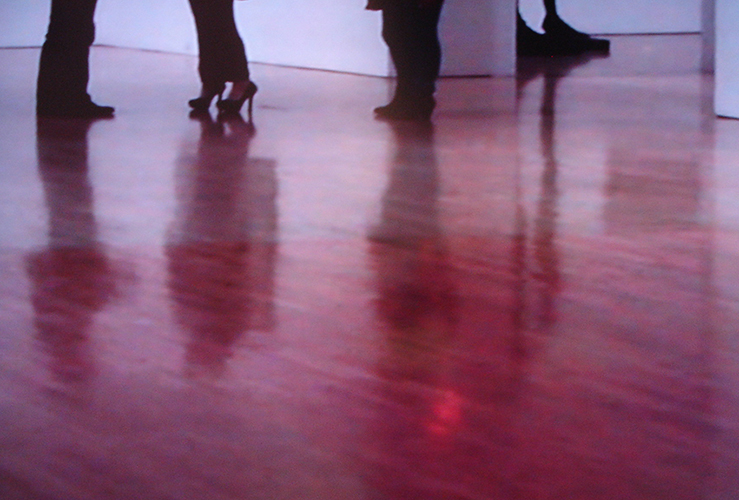 A still from the video reflection which was filmed at the Museum of Contemporary Art in Los Angeles. The video presents the sameness of museum and gallery experiences. In fact, viewers look to see if they are on live feed. Through time, my paper boats have taken me on various "travels". This has made me realize that time provides us with companions to travel with. Not always or not often family, our time companions come and go. We turn around and they have changed, come back from the past, lead toward a future, appear and disappear. It is a mystery how the sorting among people we share time's experiences with works. 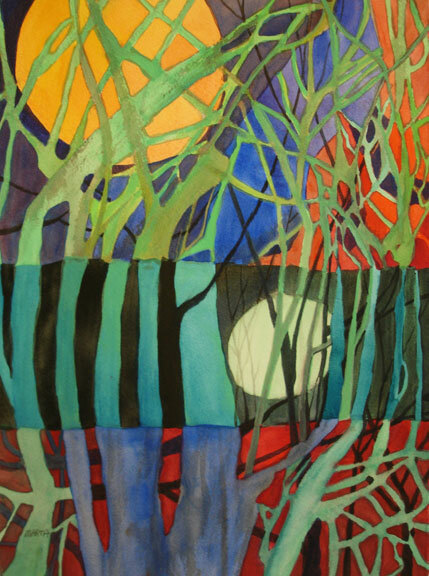 watercolor, 15" x22", 2013 Having won a Cubbison Memorial Exhibit Travel Award in Sept 2012 at Towson University, I began a Time Travelers series of artworks with this watercolor. "Mr. Sunshine" is a time traveler who dances to so many beats that he can't keep track of where he is. It is a watercolor painted in 2017, 22" high by 15" wide. 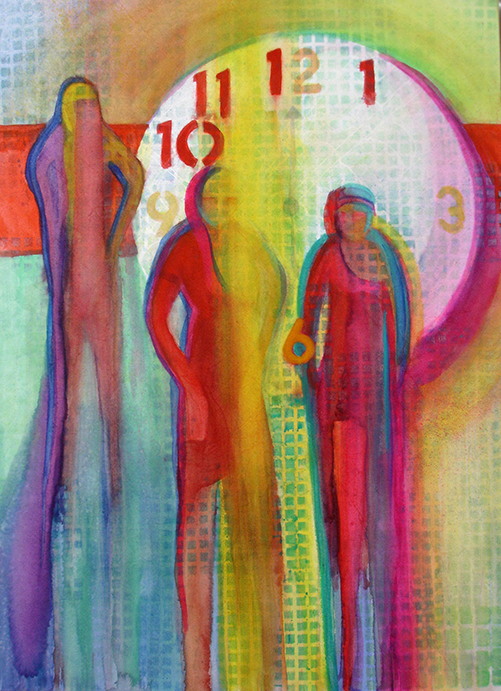 "Travelers 4" is a watercolor painted in 2017 as part of the "Time Travelers" series. 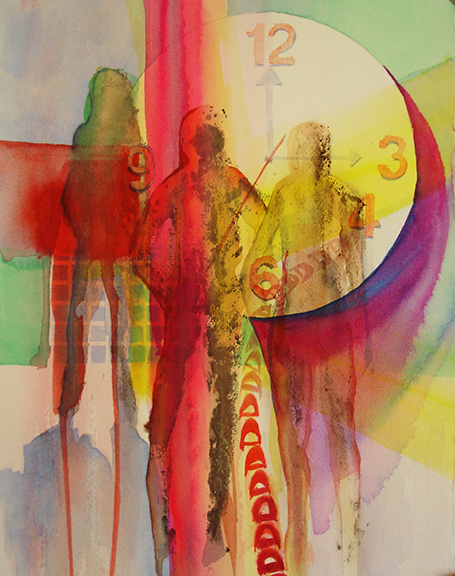 It is 12" by 12"
Inspired by the activity on the Walk of Fame in LA, this watercolor 15 in. H x 22 in. was painted in May of 2014, as part of the Time Travelers series. 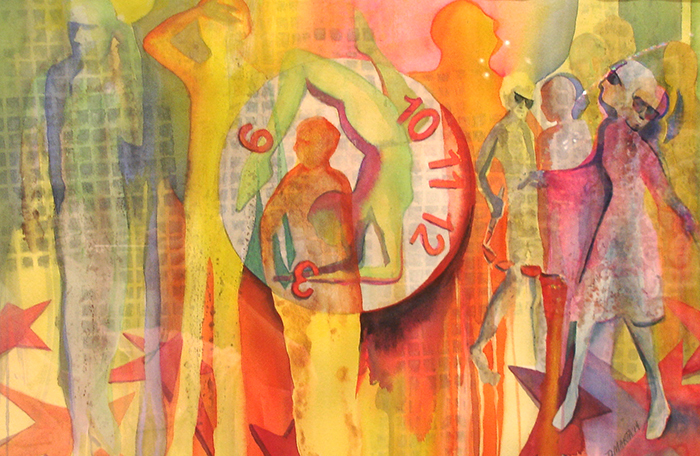 "One_Zero" is a watercolor, 24" h x 18" w, painted in 2018. 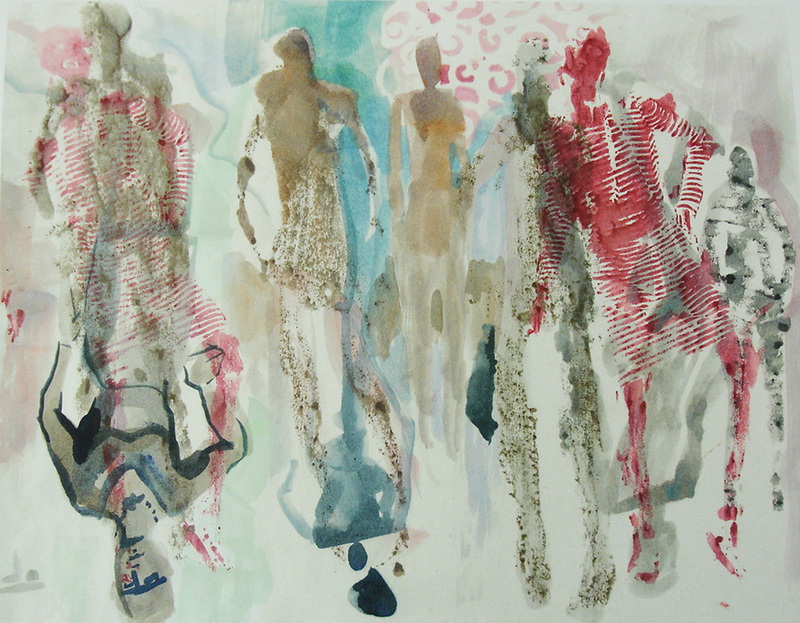 Colorful figures dissolve into pattern and color energy. There is a large time piece behind them. 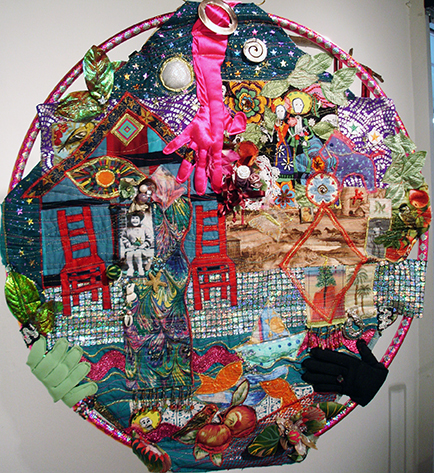 Other side of "hula hoop quilt" self-portrait. 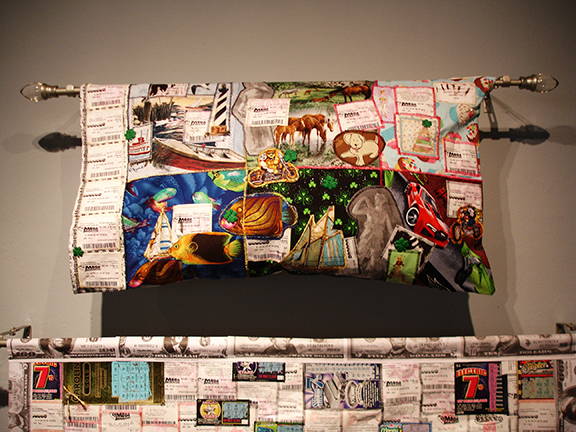 Fabric and collected memorabilia, quilted and supported on hula hoop. Nov 2013 Starting with the nursery rhyme "Wynken, Blynken, and Nod" I quilted my family origins on the other side of this quilt and continued through my adult life to the present on the this side. "What do You Wish" as if "the old moon asked" the "time travelers". Front side of "hula hoop quilt" self-portrait. 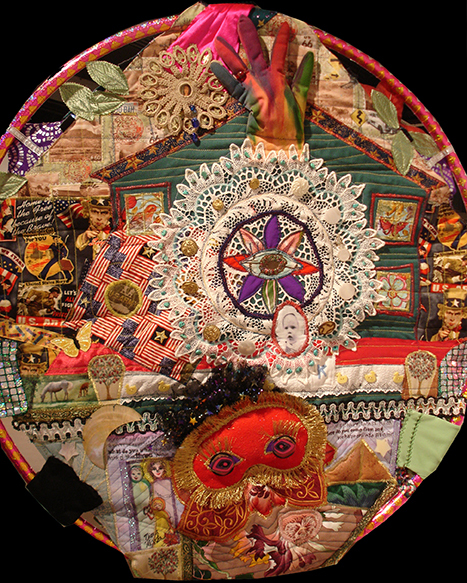 Fabric and collected memorabilia, quilted and supported on hula hoop. Nov 2013 Starting with the nursery rhyme "Wynken, Blynken, and Nod" I quilted my family origins on this side of the quilt and continued through my adult life to the present on the other side. "What do You Wish" as if "the old moon asked". I proposed, curated, and participated in this installation, inviting 14 artists to interpret the lives of ordinary women. 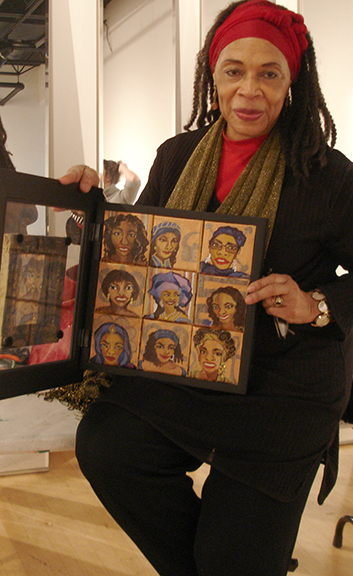 We each provided a 16"x16" self portrait for the wall as well as a garment for a vintage mannikin I named "Evelyn Everywoman"
Sharon King represented her various self personae within a box that could be opened. Oletha DeVane translated the Biblical story of Hagar's struggles in the wilderness by making her garment with barbed wire and chains. 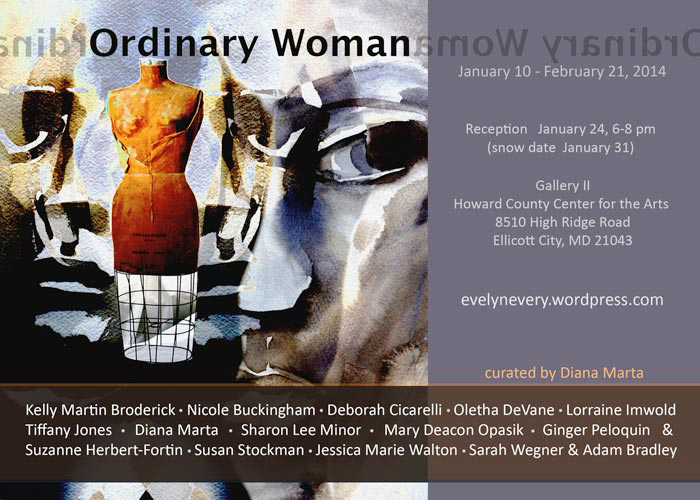 Each artist in the Ordinary Woman Installation hung a self portrait no larger than 16" x 16" on the wall. 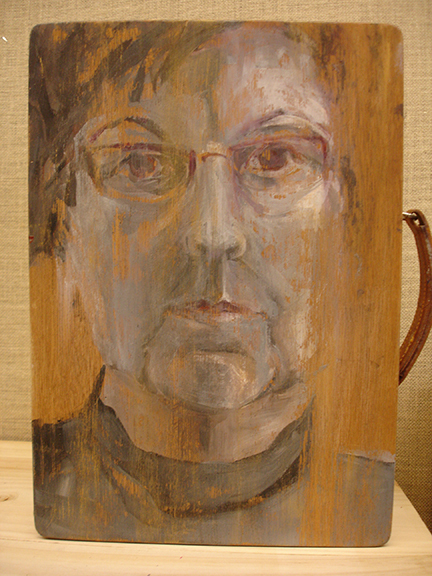 Diana Marta painted her acrylic self-portrait on a vintage wooden paintbox.The paint peeling effect on the box represents an active life well lived. Made of losing lottery tickets sewed together, this is the Lucky Dress by Diana Marta. Whatever its social or cultural implications, the Lucky Dress is meant to be worn when one wishes for things to go well. It is accessorized by a chicken wishbone necklace. The garments for Miss Evelyn were all hung at the same height from the ceiling. It was at the height of Miss Evelyn. The self portraits were then visible as if there were new garments for each angle the self portrait could be seen. Lorraine Imwold is measuring Miss Evelyn while Sharon King is working in the background. You can see the animation if you click twice. 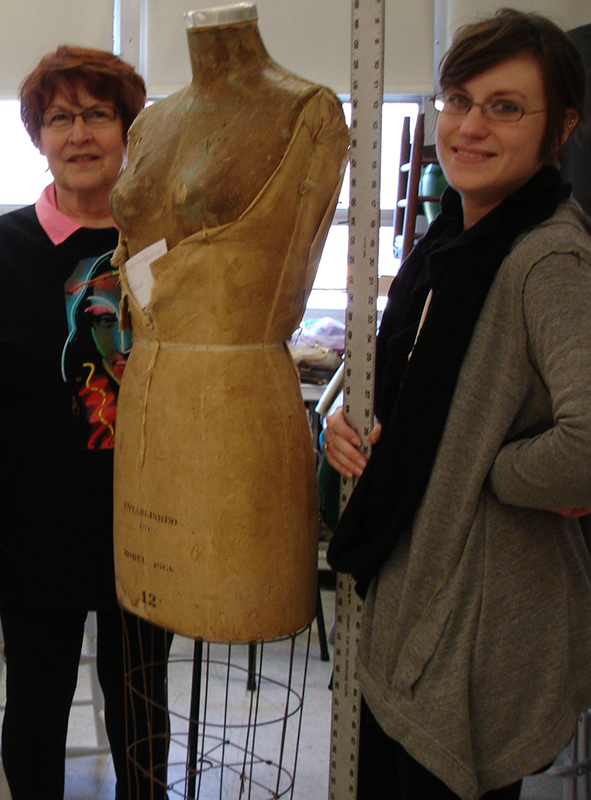 Measuring the mannikin named Evelyn Everywoman was just the beginning. 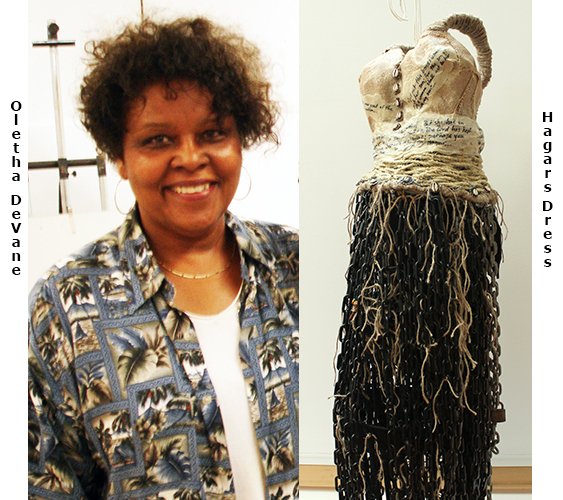 Each artist created a garment with meaning to her own life. The garments are a size that would fit the mannikin. 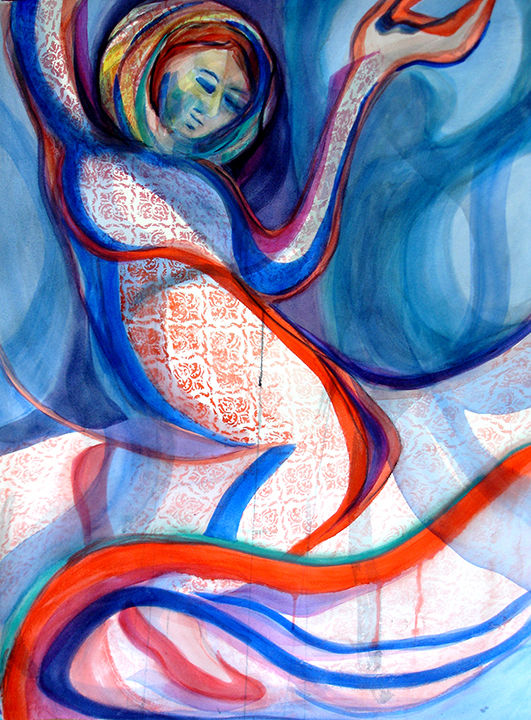 Evie 3 is one of the watercolors Diana Marta painted for the invitation to Ordinary Woman Collaborative Installation Exhibit. 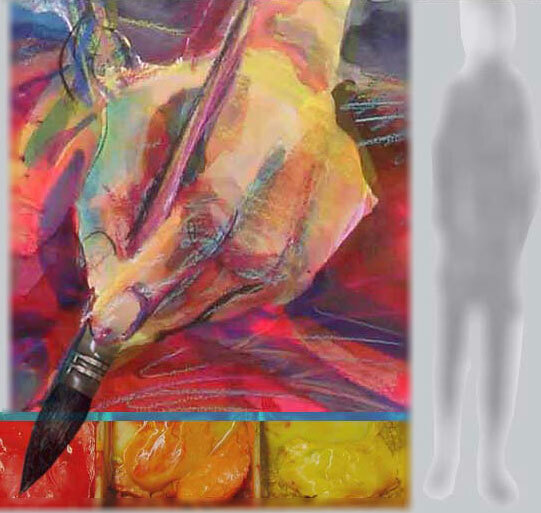 Compositing watercolor images and a photo of the mannikin called Evelyn Everywoman, Diana gave the image to Nicole Buckingham who arranged the image and text to design the invitation to the Ordinary Woman Collaboratove Installation. The fifteen participants are named in the invitation and may have their own Baker site. 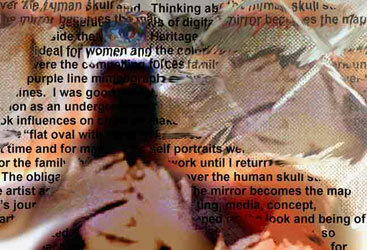 Women's concerns have been ongoing themes in my drawing, painting, and now in my digital work. I can recall blotting lipstick ever since I was a girl sneaking a chance to try my mother's colors. "Just A Minute" is the brief, repeated gesture of women applying uncountable numbers of repetitions for a lifetime. "Double People", watercolor, 2016, 15" x 20", upside down or right side up? Are we multiple people? "Mannequins" is a graphite drawing 15" x 9" from 2016. Even the placement of the dress models have heirarchy. 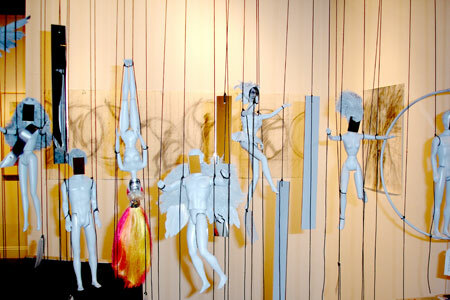 Detail from "IF" installation of puppets made with recycled 12" dolls, accompanied by a group of shadow-like drawings. 10' x 16' x 3'. Acrylic mirrors are used, too. "If" challenges our expectations and aspirations of "looking like a doll". My face is on this puppet, and some others. There are small mirrors on other puppets of both genders. 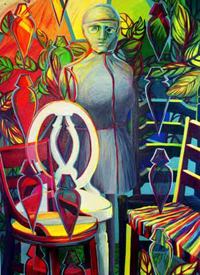 "Muse" Oil painting, 48" x 36", 2005. 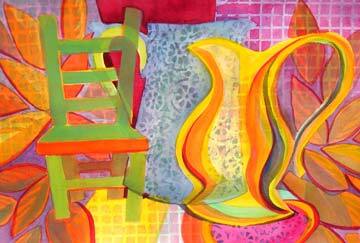 In this oil my gray, masked, studio "muse" is haloed by the color wheel and surrounded by chairs. Her mask reflects the puzzling feelings that go along with getting older. Digital Print (dye-sublimation) 8" x 10" "Little Me", excerpted from an early family photo, is surrounded by the role models of my generation which are usually the male view of the ideal for women. 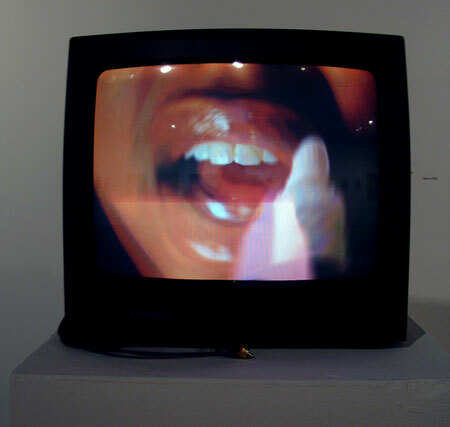 Digital image, size variable, 2008. 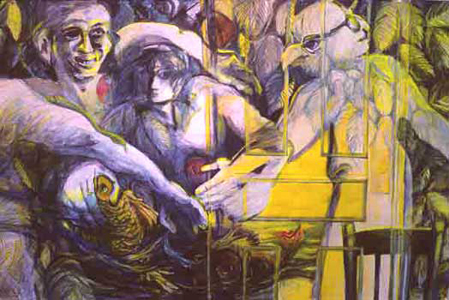 Watercolor painting, 36" x 48", 2000. From feeling faceless, nameless, to following aspirations, which women get the "golden eggs" or, who drops the "apple of Eve"? Monitor Still from "Just A Minute"
Still from "Just A Minute"
I can recall blotting lipstick ever since I was a girl sneaking a chance to try my mother's colors. "Just A Minute" is the brief, repeated gesture of women applying lipstick casually, as ritual, discreetly, provocatively in uncountable numbers of repetitions for a lifetime. Nature elicits a visual and emotional response in me. It is bigger than we are, but we need to remember that our physicality is a part of nature's cycles as well as its aberrations. From the miracle of seeds bursting with new life forms to the terror of maelstroms, both intricacy and simplicity astound. Light has more intense color than the eye can behold. Endless textures and patterns play on our senses. The lessons and narratives of the planets are orchestrated into silence and song beyond our own small understandings. So I contemplate and respond. 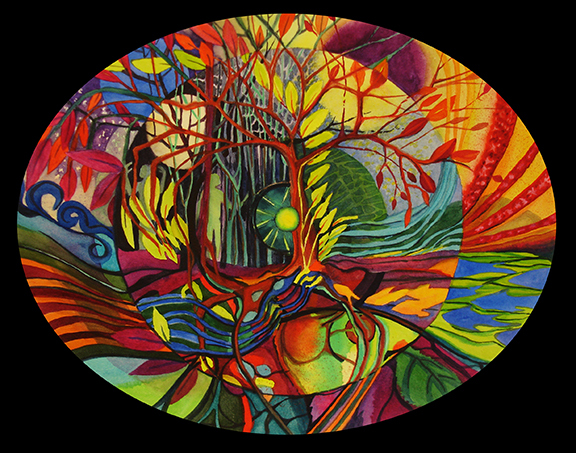 "Song of the Sea" is a watercolor, 30" high by 22" wide painted in 2017. It is a poetic response to the sounds of the ocean. 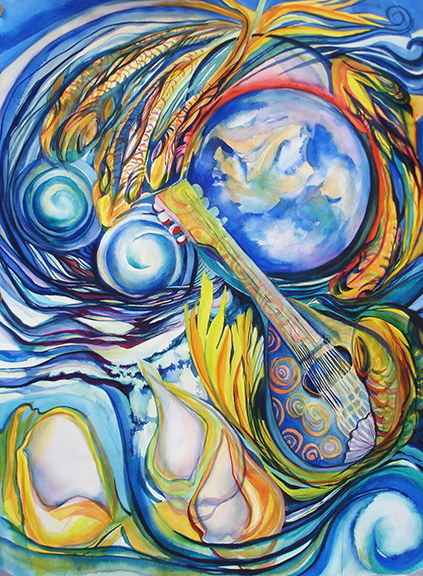 "Reverie" is a 4 foot wide by 3 foot high watercolor painted in 2017 in response to a classical guitar piece called "Memories of the Alhambra". The music brings to mind rippling waters and an Eden like garden. 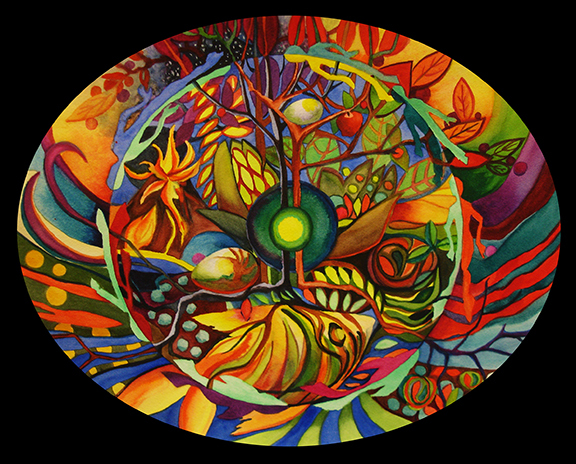 Oval watercolor, 11" x 14", 2012 We are all part of the cycles and seeds of the universe. "Teeming" is a watercolor 24" x 24" from 2016. The plentiful fish and the joy of color express a bountiful life. Chairs are objects that can convey varied meanings when included in drawings and paintings. 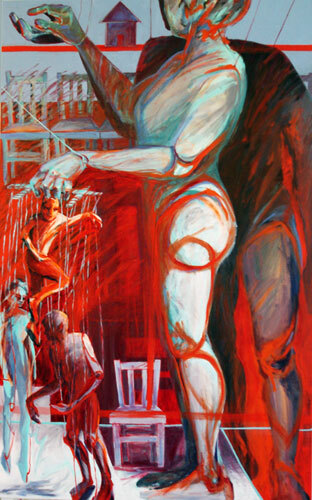 In my work they are metaphors for people and sometimes represent me. Active surfaces and layered meanings allow interpretation of chair situations as personal narratives. The vintage chairs from my family history remind me of the people with whom I shared them. 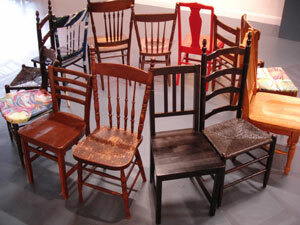 The flea market found chairs can become surfaces for art making or be arranged as installation elements. "Audience" is a group of chairs assembled as place for people to sit, to see, and to be part of an exhibit. After chairs are arranged, faux cast shadows of them are painted on the floor in a value slightly different from the floor. People sitting in the chairs are surprised that their own shadows are not part of the floor shadows. It is as if the people, not the chairs, are ghosts. 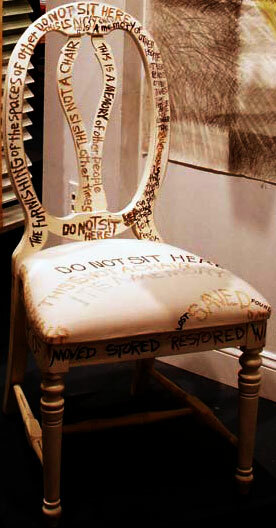 Transforming an ordinary chair into an artifact with surface text, I realized that history furniture for me is closely tied to memories of the people with whom I shared the furniture. 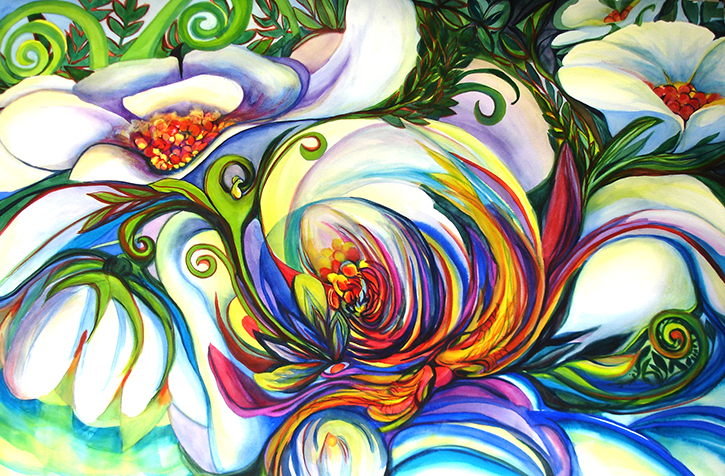 Oil painting, 48"x36", this was completed in 2006. 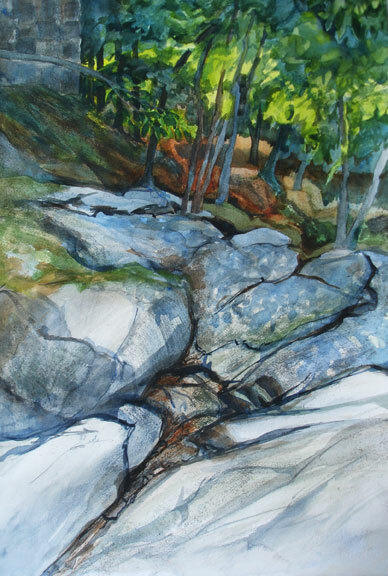 Watercolor painting, 22" x 15", March 2010. 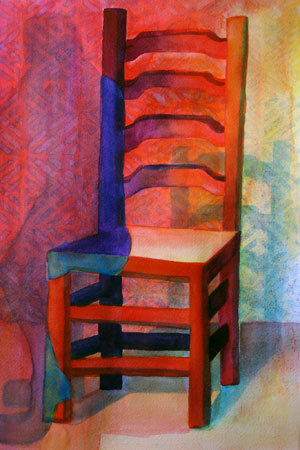 The chair and the shadow metaphorically represent the gradual passing of a dear, elderly friend and mentor. 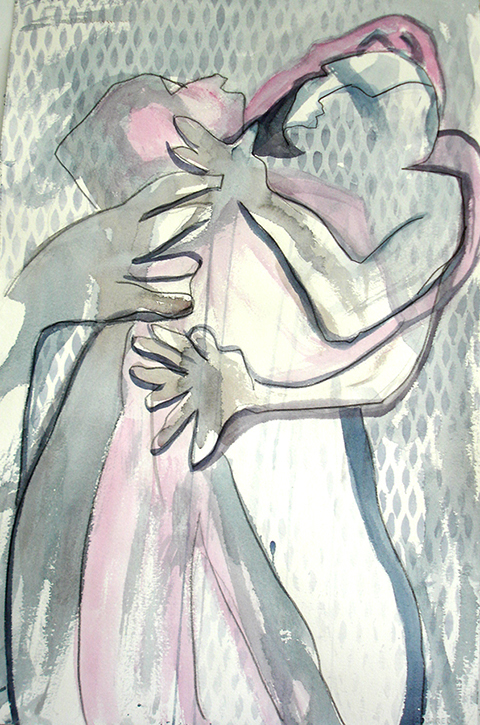 Watercolor 15" x 22", 2009. Shape, pattern, and play with a chair included. 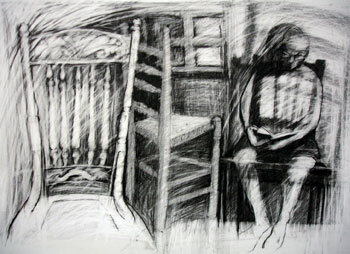 Graphite on paper drawing, 25" x 40", 2009. The vintage chair in the foreground had been my grandmother's, then my mother's. It alludes to the passing of time. A friend is almost transparent as reading transports her away from her physical self. 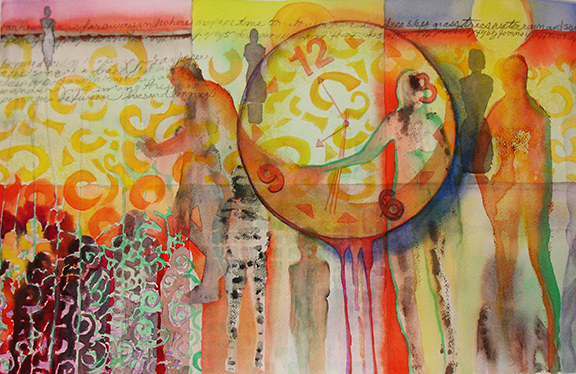 Mixed media on paper, 60" x 96". 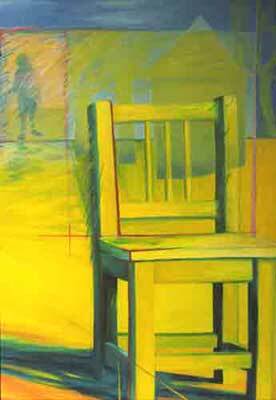 The chair in the lower foreground and the yellow door layer the meanings of domestic Eden. 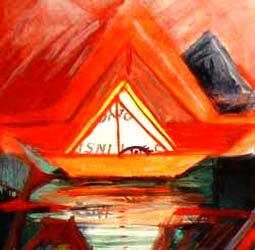 Oil painting, 48" x 36", completed in 2005, this was a "color wheel" play on the props and patterns in my studio. 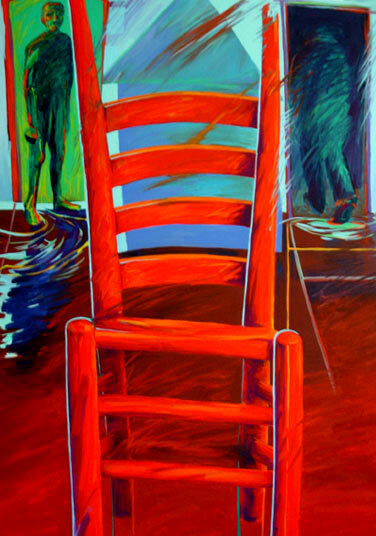 Oil painting, 48" x 36", this narrative was finished in late 2009, complete with an audience of chairs. 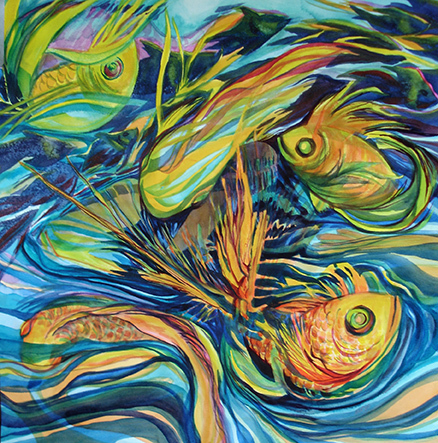 Oil painting, 48"x36", completed in July of 2007, it was included in the Maryland State Arts Council 40th Anniversary Exhibit. 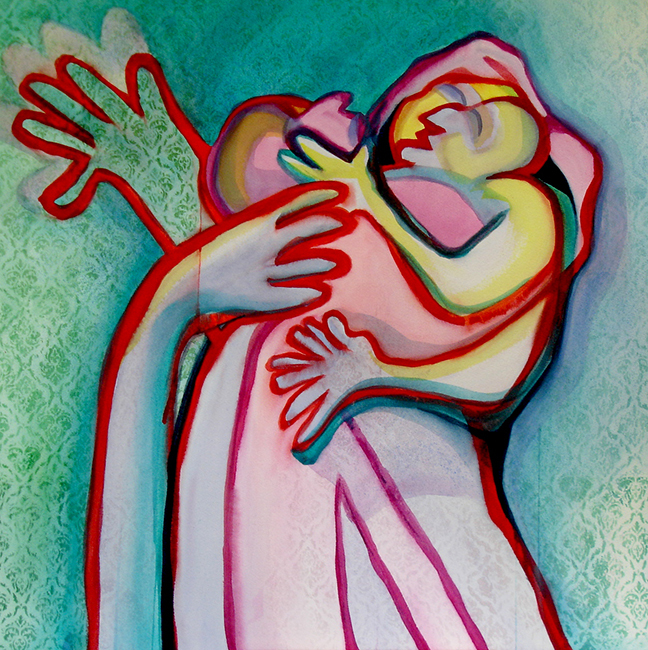 I wanted to paint with red and this reflection on changing generations evolved. In life and in making art, it sometimes feels like there is an outside force pulling the strings of one's intentions and the intentions of others. 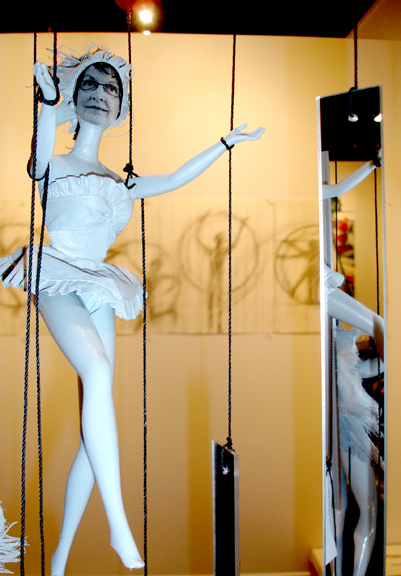 My puppet series has emerged from those feelings of action/reaction, control/response, structure and free fall. This results in simultaneity, many things happening at once with layered meanings, while other stuff is going on behind the scenes. The free fall is my comfort zone in moving from one kind of space or materials to another. Possibilities aren't eliminated by my drawing or painting in only one format. As the works transition and grow they develop unexpected aspects. This is a detail of the "If Installation". 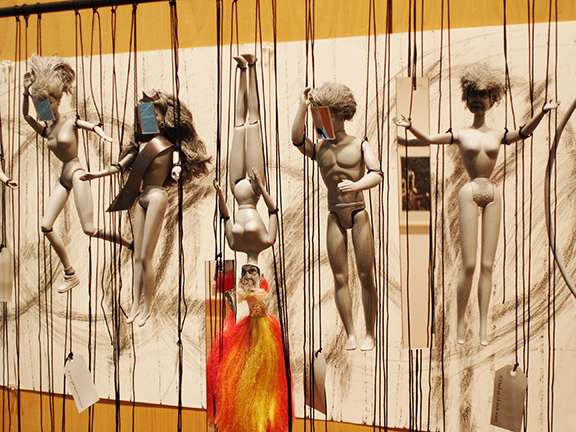 I used flea market found 12" dolls as puppets with "if only" tags that represent human wishes and intentions. This puppet has a photo of my face pasted on it. Other puppets do, too. And many have small mirrors to reflect the viewers face. 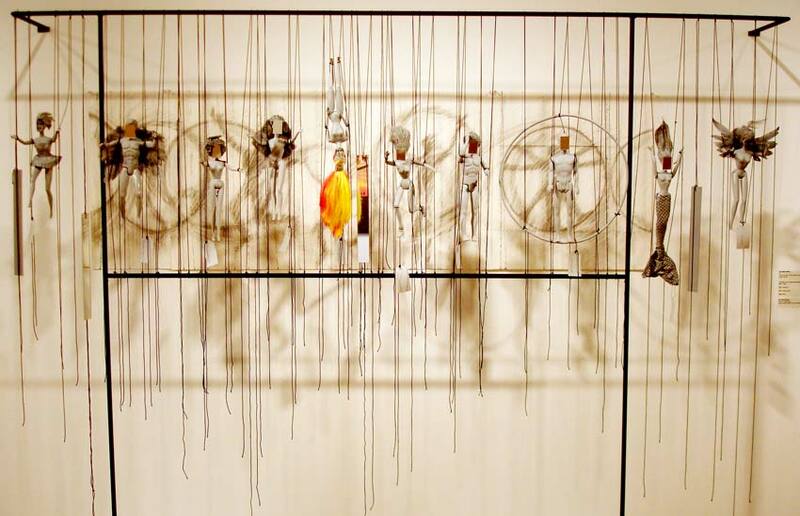 Suspended from a metal grid with black lines, and backed by a series of shadow-like drawings, the puppets are part of a spatial installation that relates to the shadows cast on the wall. Puppets with mirrors and pieces of mirror acrylic that reflect the viewers are parts of the "If Installation". 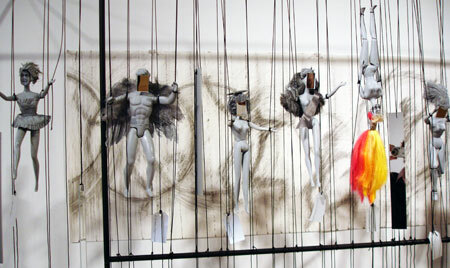 This is a detail of the first time "If" was installed with drawings and shadows behind it. 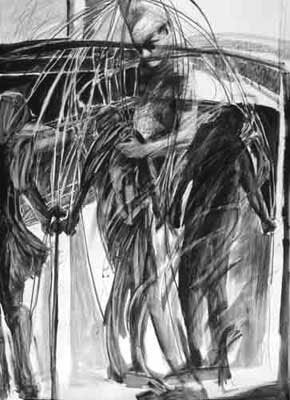 My first puppet themed drawing is graphite on paper, 60" x 48", 1993. 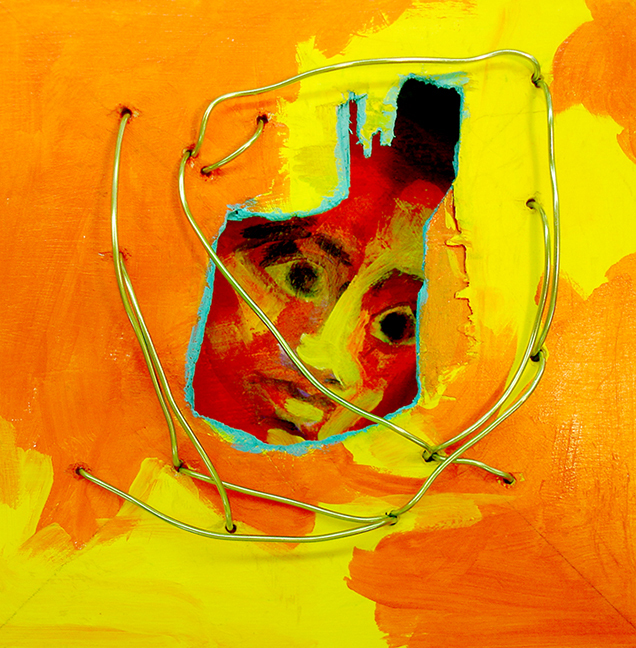 This is an oil painting, 48" x 36", 2009, which was done simultaneously to the "If Installations"
Paper, paint, canvas, pencil, recycled flea market finds, and digital work. 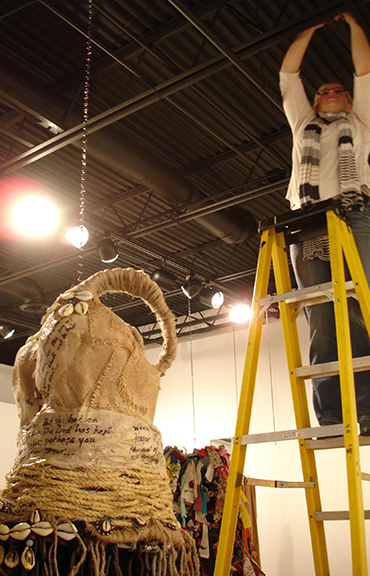 As part of the Ordinary Woman Installation each artist completed a self-portrait. Diana Marta painted hers with acrylic in Jan 2014 on the front of an old wooden paint box. Inside are mementos and memorabilia that represent elements of her life. 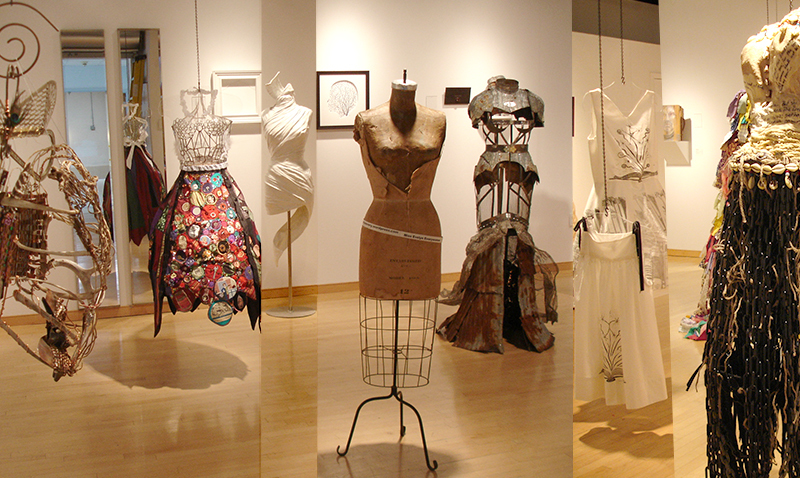 Lucky Dress was completed in Jan 2014 as garment for Ordinary Woman Installation. Like the Security Blanket it is made of losing lottery tickets sewed together. 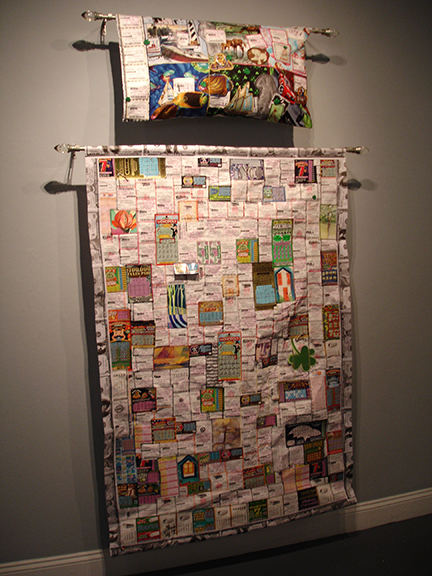 Repurposed lottery tickets sewed together to make a "security blanket" and pillow cover of lottery dreams, July 2012. 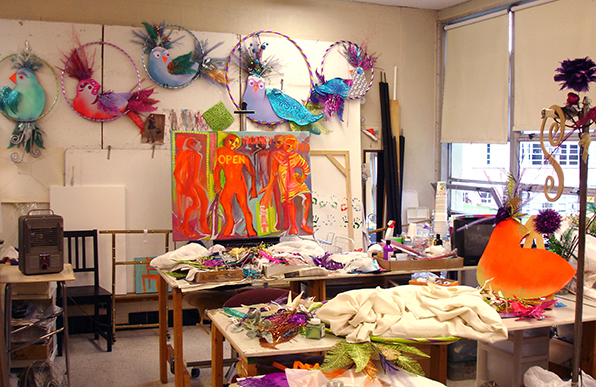 Juried into ARTSCAPE 2012 at the Catonsville Campus of CCBC. 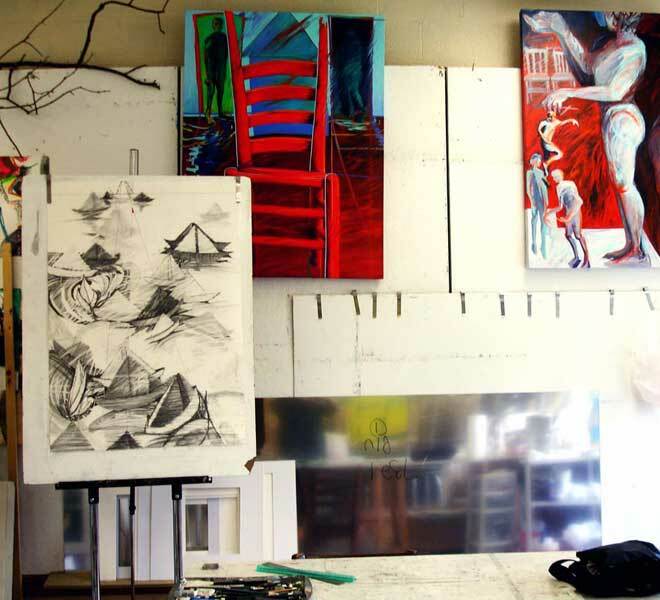 Drawings and paintings in progress in my studio. 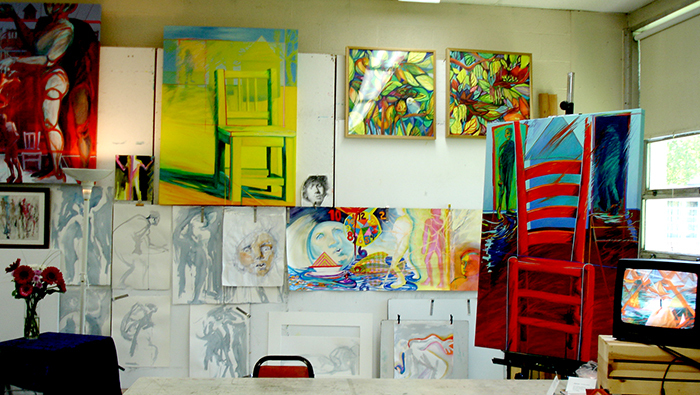 Works in progress, finished paintings, and an animation video evidence a very active 2017 studio. The Whimsical Window Birds perched in hula hoops took over the studio in preparation for Window Wonderland at Harbor East. An oil is in progress on the easel.